Faces of excited fans line a racetrack sectioned off with hay bales as participants gear up for an intense race. Dogs of all shapes, sizes and speeds are placed in the starting box at one end of the track. After a starting signal, they barrel toward the finish line, ears flopping in the wind to greet their owners. 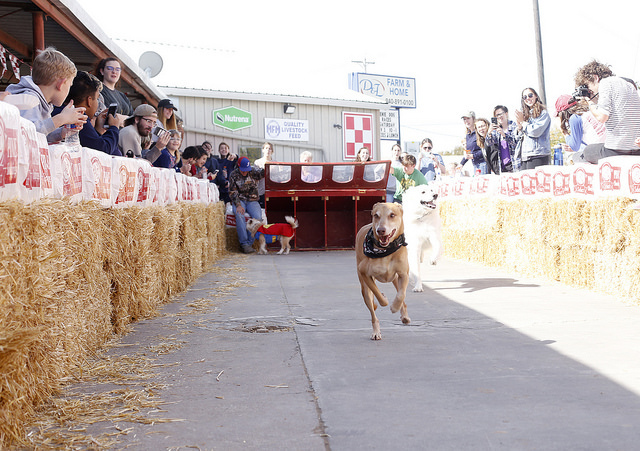 Every year, dozens of dogs and dog lovers swarm the D&L Farm and Home Denton location for the Annual Weenie Dog Race, where canines of every breed are allowed to compete in both races and a costume contest. Jennifer Sanders and her husband purchased their first D&L Farm and Home in 2009. 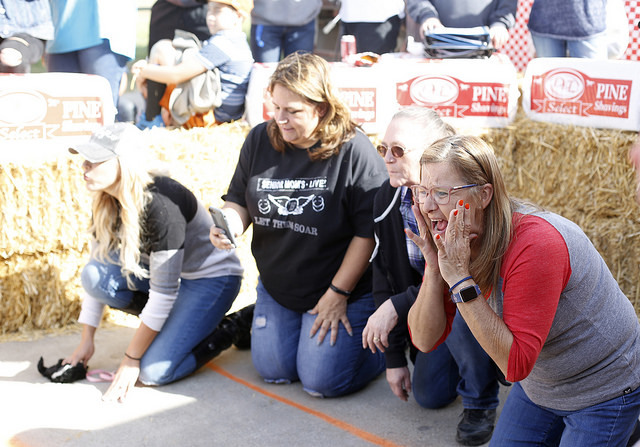 Other stores in the chain had been doing the weenie dog races for years, so Sanders believed they should carry on the tradition in the Denton community. It is difficult to argue with Miller, considering many of the attendees and dogs have been competing in the competition for years. Organizers said this year was their largest event to date, going from around 12 weenie dog sign-ups in 2017 to about 40 this year. A long-time competitor and winner of this year’s costume contest was Tommy, a Xoloitzcuintli or Mexican hairless dog dressed as a pirate alongside his owner, who was also sporting a pirate outfit. He has won every costume contest to date since the competition was added to the event several years ago. However, Tommy excels in more than just costumes. 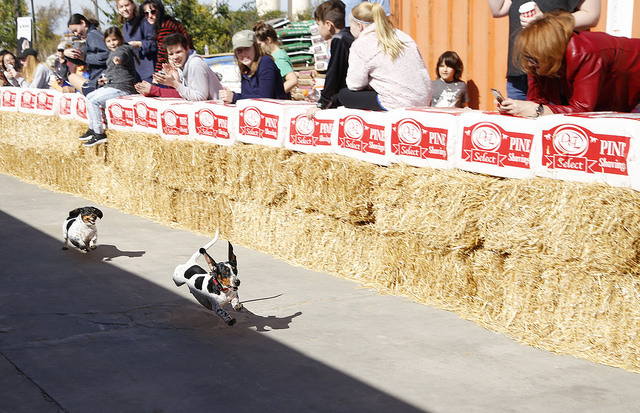 While much of the races come down to chance, many of the dogs compete against each other year after year, which has made some of the owners very competitive. Competitor Devon Cooper has raced her dog at the event for the past six years. El Chappo is a fan favorite of the event and is easily recognized by many of the D&L Farm and Home employees. Cooper is competitive in general, but her main concern is the rivalry between El Chappo and his brother Shorty. While El Chappo has never won the overall competition, his mom remains hopeful. He won his heat this year but was beaten out in the finals. While Cooper’s heart’s desire is for El Chappo to take home the prize, his motivation seems to lie in a different organ. El Chappo is not the only racer motivated by a meal at the finish line. Four-year undefeated champion Dexter, a dachshund, has a similar mindset when it comes to racing. 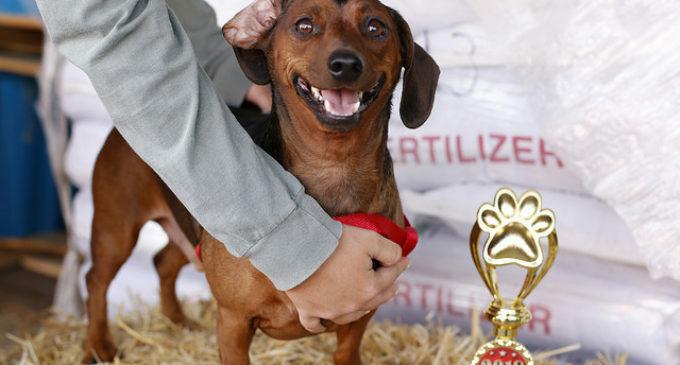 Dexter won the overall racing competition for yet another year in a row, beating out not only the other dachshunds but the winners of both the medium and large dog categories, as well in an overall finalist heat. Smith and Dexter took home a large handmade doghouse this year to add to their collection of trophies, which Smith says decorates their fireplace mantle. While Dexter may be the dog to beat, Smith takes a more relaxed approach to the event. With so many return visitors, community seems to be a focal point of the competition for both the organizers and attendees.